This portable unit has a 14-pitch range, so you can modify your voice a full seven pitches up or down. 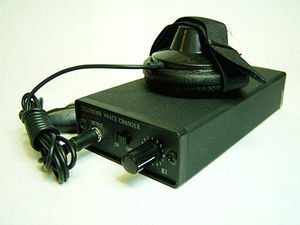 Just speak into the built-in microphone and the changer projects your altered voice. This top of the line gadget also has volume controls and secures to most phones with its Velcro strap. Runs off a single 9v battery (not included).